The main advantage of hosting service in IIS is that, it will automatically launch the host process when it gets the first client request. It uses the features of IIS such as process recycling, idle shutdown, process health monitoring and message based activation. The main disadvantage of using IIS is that, it will support only HTTP protocol. Step 1:Start the Visual Studio 2008 and click File->New->Web Site. 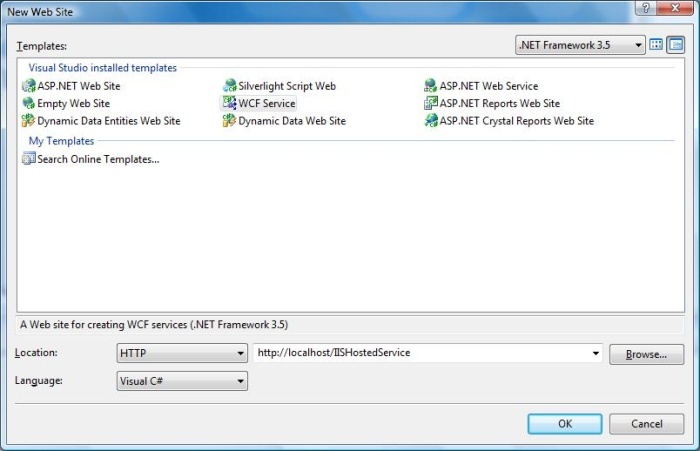 Select the 'WCF Service' and Location as http. This will directly host the service in IIS and click OK. Step 2: I have created sample HelloWorld service, which will accept name as input and return with 'Hello' and name. Interface and implementation of the Service is shown below. 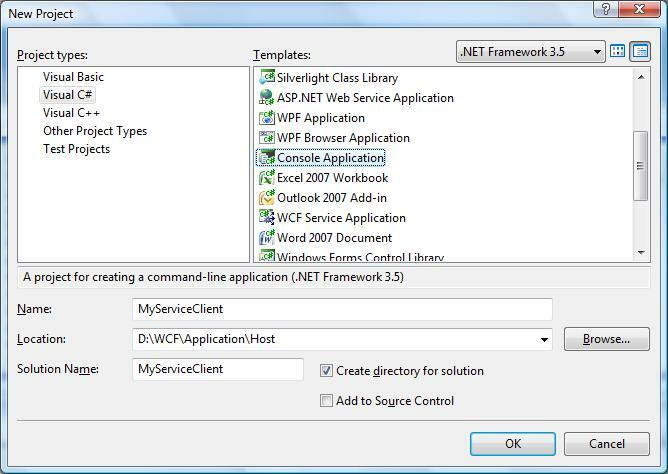 Step 3: Service file (.svc) contains name of the service and code behind file name. This file is used to know about the service. debugging purposes, set the value below to true. This screen will appear when we run the application. 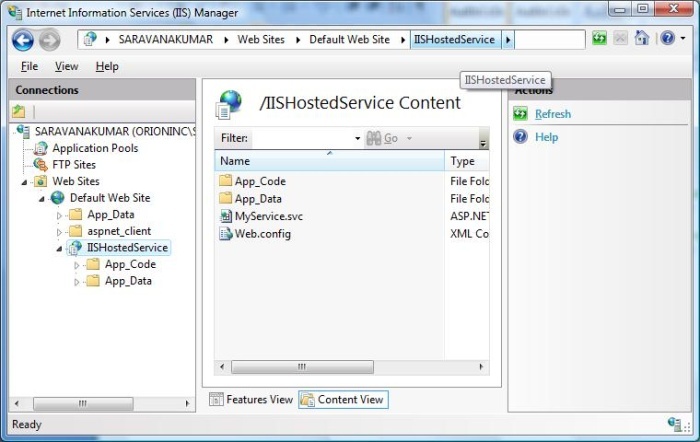 Step 5: Now we successfully hosted the service in IIS. Next we have to consume this service in client application. Before creating the client application, we need to create the proxy for the service. This proxy is used by the client application, to interact with service. 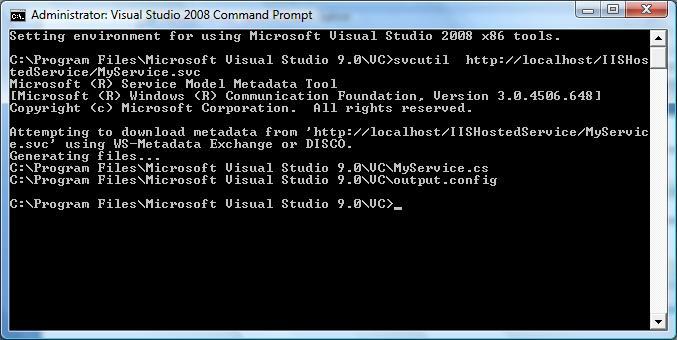 To create the proxy, run the Visual Studio 2008 command prompt. Using service utility we can create the proxy class and its configuration information. After executing this command we will find two file generated in the default location. output.config - Configuration information about the service. Step 6: Now we will start creating the Console application using Visual Studio 2008(Client application). 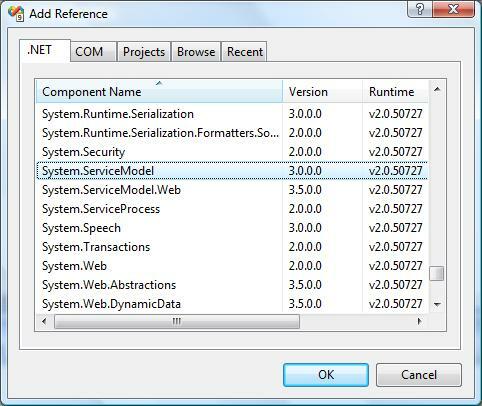 Step 7: Add the reference 'System.ServiceModel'; this is the core dll for WCF. Step 8: Create the object for the proxy class and call the HelloWorld method. Step 9: If we run the application we will find the output as shown below. I hope you have enjoyed the Service hosted in IIS. Now let start the look on the self hosted service.